I used to believe that uncertainty had no place in my world, if I wanted to be happy. Being right was the Most Important Thing. Over time, the practices of mindfulness and spirituality, in particular, showed me that turning things over to the universe and being unsure are actually key to my personal happiness. At the beginning of my career growth, I became a manager of clients and employees, which gave me a lot of opportunity to dictate what was ‘right’. Naturally, I started believing that ‘rightness’ was a virtue, ‘wrongness’ was a weakness, and that I could only exist in one of those two states. This led to the conviction that absolute control over my life would make things better. Later in life, I tried speaking less and listening more – maybe being right wasn’t all I had built it up to be. What if being happy meant an ability to apologize for mistakes, then move on? What if I didn’t carry work stresses home with me? What if I could sleep through the night and be at peace with myself? Could this be the happiness that was eluding me? 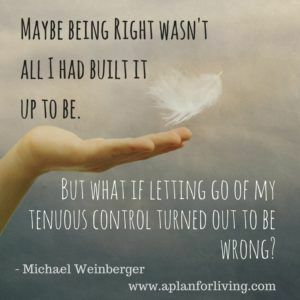 But what if letting go of my tenuous control turned out to be wrong? Letting go was terrifying. It shoul d be obvious to others that the world will continue to spin whether or not I am right or in control. However, realizing that for myself was harrowing. I got divorced. I was suicidal and hospitalized. I lost half my company. What I didn’t realize was that the universe was making room in my life for what I truly needed. Since hitting that life low, I remarried, found a new (stable!) medication regime, had two healthy kids, my company has more than tripled, and everything is amazing. Was any of this possible while I was ‘in charge’? In hindsight, probably not. But it is what helps me to be happy. Deciding that I would rather be happy than right gave me a better perspective on parts of myself that I had never thought to examine before. Once I realized that my control was a sham, I changed my mindset, then my life. The astounding thing is that, since that switch, I have received different outcomes for my efforts. Today, I am baffled by my prior experiences – the more control I exerted, the less I could hold on to and actual outcomes were unpredictable no matter what I tried. All of that is not to say that my life is perfection, sunshine, and roses all day, every day: I have lost clients. I have lost arguments with my wife. I don’t always agree with my business partner. The one universal truth I know is that I will be taken care of. It feels as though the more trust and faith I put into the universe the more the universe gives back to me. Today, when I am unsure, I pause and wait for an intuitive thought rather than losing hours of sleep and months of energy fighting the inevitable. I may not always know the ‘right’ thing to do, but I can figure out what is wrong and that my real job is to avoid the latter. When I get scared and lose faith, I reflect on the situation and see if I have dealt with it in the past. Recently, my business’ credit line peaked. Past-me would have panicked and started making calls to clients, fire employees, and impulsively implement ‘solutions’ before identifying whether a problem really existed. This time, I went home, created my spirituality and gratitude lists, and gave myself time to process the situation. Once I finished the exercise, I decided that the wrong choice would have been to initiate action without giving the credit line time to work itself out. Instead of making hurried changes, I pushed ahead with my planned week and generated more than enough new business to justify the investment. I was also able to identify and resolve the cash flow issues that had caused the red flag. Trying to be right never helped me handle uncertain situations with the grace and wisdom that I was able to summon in this example. Today, I have decided that I would rather be happy than right!